The interior of Forum, formerly known as the Forum Cafeteria. Photographed on April 23, 2010. 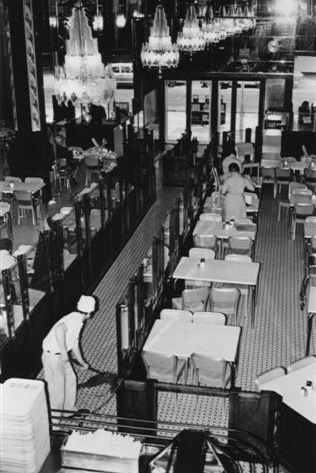 The former Forum Cafeteria space in downtown Minneapolis opened to the public once again last week, and with that happy event comes a long, fascinating and complicated history. 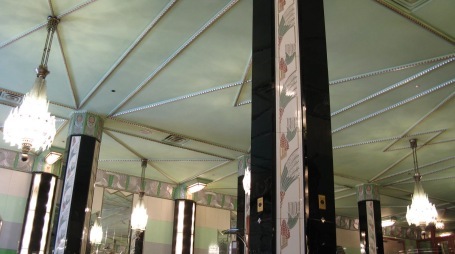 Many local diners will mostly likely remember the gleaming Art Deco space as Goodfellow’s, which occupied the room from 1996 to 2005. Prior to that, it housed Mick’s, Paramount Cafe and Scottie’s on Seventh. And that’s just the tenant list after the entire room was dismantled, moved from its original location and re-created inside the mammoth City Center complex. Before that it was also Scottie’s on Seventh and, for the years between 1930 and 1975, it was the home of Forum Cafeteria. After spending some time carefully pouring through small green envelopes jammed with yellowing newspapers clippings from the Star Tribune library -- thank you librarian Sandy Date, for retrieving them from the faintly scary Strib basement -- and sorting through a considerable stack of archives at the far lovelier Minneapolis Central Library, here’s some of what I’ve discovered about the Forum Cafeteria. Settle in, this post is going to take a while. The Forum’s roots predate its 1930 Art Deco trappings. What had been a livery stable as late as 1911 was demolished to make way for the lavishly appointed Saxe Theater, which opened on Sept. 5, 1914 at the cost of $150,000 (about $3.3 million in 2010 dollars). The 1,500-seat theater was named for owner Saxe Bros. of Milwaukee, a small chain of 10 midwestern theaters. Historical accounts of the Forum often describe the Saxe as a vaudeville house, but an Aug. 26, 1914 newspaper article tells a different story. “It is just about a year ago today that the announcement was made of our intention to build a theater designed exclusively for motion pictures, to be one of the best arranged and equipped photo-play houses in the country, and I think when the doors open Saturday of next week the public will agree that we have kept our word,” said owner Thomas Saxe. The opulent Spanish Renaissance-style building -- designed by the Minneapolis firm of Chapman & Magney -- was tricked out with all the latest features: a 2,000-bulb electric marquee, “the largest picture screen in the Northwest” (measuring 13 feet six inches high and 18 feet in width), a $10,000 electric pipe organ, flounced velvet drapes, the city’s first electric ventilation system (“Said to have cost $16,000, injecting 35,000 cubic feet of fresh air into the theater every 60 seconds and completely changing the entire atmosphere every 10 minutes”), an elegant mahogany and rose-and-ivory terra cotta interior decor (and a lobby lined in “foreign marbles”) that was finished with two massive bronze candelabras, an automatic ticket seller (“which is new here, which will greatly expediate the handling of crowds”) and plumbing that is “the last word in the way of sanitary precautions.” The theater’s ivory terra cotta facade quickly became the most distinctive sight on Seventh Street's bustling theater row. The Saxe name didn’t last long. By 1916 the marquee bore the name “Strand,” which stuck until 1929, when the Forum Cafeteria Co. of Kansas City, Mo. signed a lease on the space, with the intent of converting the theater into a restaurant. It would be the company’s 18th location. The company enlisted its house architect, George B. Franklin, and poured $275,000 (about $3.6 million in 2010 dollars) into creating a state-of-the-art kitchen and carving out a dining room on the street level, with additional seating on a new mezzanine level. The restaurant was designed to accommodate approximately 1,000 customers per hour and it initially employed about 150 people. The doors opened for business on May 27, 1930. It wasn’t exactly the most encouraging moment in American history to launch a major investment, but by all accounts the Forum survived and thrived on Seventh Street. The Forum Cafeteria, probably sometime in the early 1970s. Star Tribune file photo. Fast-forward to early 1970s. The Forum was in the departure lounge. Cafeteria-style dining was on the wane -- replaced by fast-fooders such as McDonald’s and Burger King -- and rumors began to swirl that the mighty Forum’s lights were dimming. An entertaining eyewitness account appeared that same day on the pages of the Minneapolis Star’s op/ed section. “Alarmed at the possibility that the Forum Cafeteria might undergo modernization, as reported in a letter to the Star, we dashed off to 7th St. for lunch and reassurance,” read the unsigned editorial. “At yet, nothing had changed. Viking ships under full sail still plowed the seas of mirrored wall panels. Platoons of chandeliers, their frosted glass marshaled in geometric array, still cast their chill glow over the double line of expectant diners inching food-ward. Behind us in line, there was still the aggressive woman shopper whose bargain-filled bag thumbed at the backs of our knees with each step of advance [this was a pre-Mall of America era, when no less than five department stores and countless specialty shops lined nearby Nicollet Mall, and it was still possible to see a first-run movie at any of a number of theaters on and around Hennepin Avenue]. 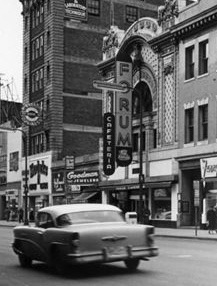 The Forum Cafeteria company wouldn’t permit the use of the Forum name, and for a while the project was being referred to as the “Phorum.” “This place will always be called the ‘Forum,’ regardless of who’s selling the hot dogs,” Smith told the Minneapolis Tribune. The name Scottie’s on Seventh eventually stuck. 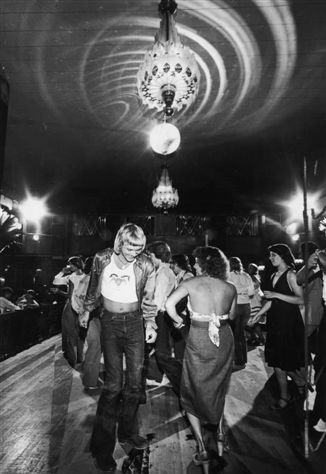 Disco inferno: The scene at Scottie's on Seventh, probably around 1977. Star Tribune file photo. Scottie’s quickly evolved into a scene. The Wolverines jazz band were regulars, and the city’s fast crowd made it their hangout. This clip from the Oct. 24, 1978 edition of Skyway News sums it up nicely: “Jet set artist and Olympic sports painting superstar LeRoy Neiman was served a Bernaise burger and inaugural champagne recently at Scottie’s on Seventh, the downtown restaurant and disco. The Bernaise Burger is a favorite of the many celebrities who frequent the pub. Neiman brought the burger’s recipe to Scottie’s from P.J. Clarke’s in New York City, the first in a series of exchanges Scottie’s plans with other restaurants around the world.” I wish I could share the photograph, because it is priceless: Neiman is sporting a mustache that stretches almost from ear to ear, his hair is slicked back and his shirt is unbuttoned halfway to his navel; prime disco style. Here’s how Will Jones described the place in his “After Last Night” column in the Minneapolis Tribune on June 19, 1976: “The vintage air conditioning may have been adequate to the elderly frames who shuffled their trays through the Forum in its later days; it was clearly not a match for all the hot young bodies crushing up to the bars and working up Charleston variations on the dance floor. The party didn’t last long, thanks to the mammoth City Center project. It had been brewing, off and on, through much of the 1970s, growing in ambition and size, biting off more and more chunks of the block bounded by Nicollet Mall, 7th Street, Hennepin Avenue and 6th Street. The old Forum building was sitting smack dab in the middle. Original proposals priced the complex at $100 million; the tab eventually hit $200 million, with the city’s investment -- its largest at the time -- at $50 million. Not everyone was thrilled by the prospect by City Center’s mega-ambitions (“A super-Dale in the heart of Minneapolis” is how the Twin Cities Reader described it), particularly fans of the old Forum. Boy, did he have this next part right. “A new vista will emerge on 7th St, without mystery or memories. A new City Center complex that has hurdled every cost-benefit analysis by those who rule will be created. We suspect there will be clean design. Certainly there will be much glass and light. There will be no smokey sensuality. This new place will be no place for indolent denizens of Minneapolis to hide out. And that is a fact. “We do know that without the lingering ambience of old places, not necessarily warehouses and post offices, an environment becomes very boring, and people spend their money in Europe or Mexico. Authentic history for many people is found in little clubs, theaters and restaurants. These places make a city interesting. Domed stadiums [construction on the Metrodome would begin a year later] and City Center, on the other hand, contribute little to the attraction of an urban area. Oxford initially claimed that Forum’s site was needed for a luxury department store [rumored to be Neiman Marcus or Saks Fifth Avenue] and then as access to an underground parking ramp; both scenarios eventually fell through. Still, through a series of negotiations and legal maneuvers, Oxford eventually pledged to reconstruct the Forum’s exact interior in a new location, funded by a $1.1 million in city funds, a precursor to the city’s subsequent investment in preserving and moving the nearby Shubert Theatre in 1999. The restaurant’s interior ended up moving 100 feet. The painstaking process -- which involved carefully removing, cataloguing, storing and then unpacking and reinstalling 3,500 separate pieces of glass, mirrors, tile and other materials -- was remarkably accurate. The rectangular room’s interior dimensions fell within 3/8th of an inch of the original: 105 feet long, 48 feet wide and 18 feet high. The Forum’s original plaster ceiling, which had been covered in that 1940 renovation by acoustical tiles, was reinstalled and painted its original 1930 colors. The work was supervised by Dayton’s Commercial Interiors. The exterior of the Forum Cafeteria, at 36 S. 7th St. in downtown Minneapolis, in 1960. Star Tribune file photo. Frankly, yes. When it comes the Forum’s convoluted story, everything is possible. Scottie’s didn’t last, closing less than three years after its 1983 reopening. John Rimarcik, owner of the Monte Carlo Bar & Grill, briefly ran the place as the Paramount Cafe. The TGI Friday’s chain was interested in the space but not the decor, and there was talk of taking it all down and reinstalling it elsewhere, perhaps as part of a new federal courthouse or downtown public library, or in a renovated Grain Belt Brewery or Washburn-Crosby Mill (now the Mill City Museum). Fortunately, that never happened (TGI Friday’s did move into another City Center space, but eventually left). Atlanta-based Mick’s leased the space for four years. Then Goodfellow’s, which was looking for a new location to replace its doomed Conservatory home, moved in and stayed until 2005. That’s the Forum that many people remember, although it was a tamed Forum; Goodfellow’s owners covered (some might say conserved) much of the interior’s colorful Bakelite walls with beige fabric panels, a move to lessen the room’s booming acoustics. So what was the Forum Cafeteria like? 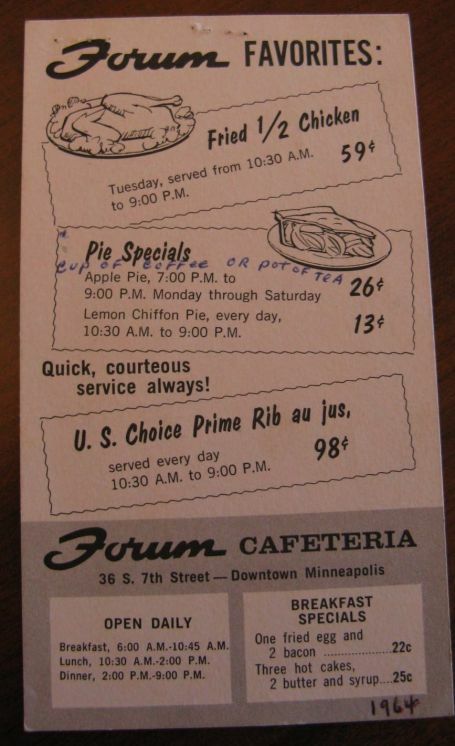 Lemon chiffon pie for 13 cents: A 1964 Forum Cafeteria menu. From the Minneapolis Collection at the Hennepin County Library. I like this one: “The Forum was in many respects the Twin Cities’ most delightful Art Deco fantasy, one still remembered fondly by those who had the good fortune - especially as children - to experience its sleek, silvery splendor,” explained Larry Millett in his invaluable “Lost Twin Cities," published by the Minnesota Historical Society Press. Counter Intelligence: Newbies, ginger ale and Earth Day, cont.